Classic beach game and truly a beach favorite. Soft, safe exciting fun that needs no net or court. 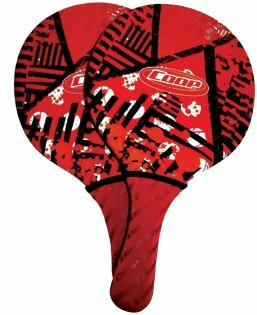 Includes 2 paddles and 1 ball. Paddle measures 15.5" length. Product Dimensions: 16.75" x 10.25" x 9.5"
Make your favorite CarsÂ® Dive Sticks characters dive under water in the pool or bathtub and watch bubbles come out as â€œexhaust!â€� You can play with them in or out of water! Ages 5+. Adult supervision. 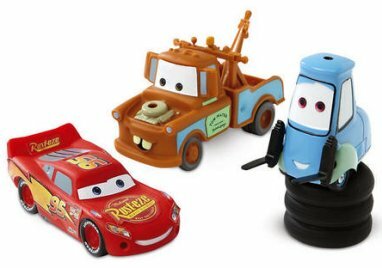 Lightning McQueen - 2 1⁄4" x 4 3⁄4"
Tow Mater - 2 1⁄4" x 4 3⁄8"
Guido - 2 1⁄2" x 4 1⁄2"
Great for kiddie pool fun! 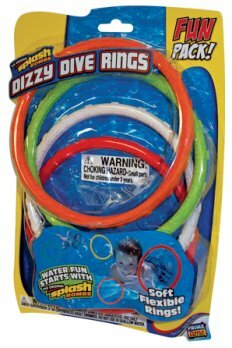 Have a splashing good time diving for the Dizzy Dive Rings. Ready, set, swim. Swim for competition, your personal best, or for lap-counting exercise, espn swimming challenge tracks your time or your laps exactly. High-tech touch pads for two swimmers mount on the wall or sit on the side of the pool for ease of motion while swimming. Pooside timer allows for competitive swim training. 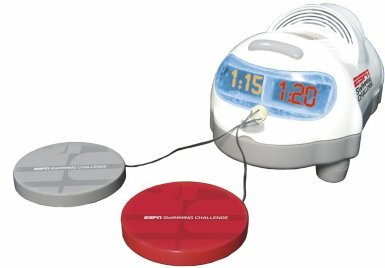 Accurate led timer flashes the winning time. Optional espn sounds cheer the winner. Race and lap counter modes. Built-in storage and carry handle. The 18th hole - just for the pool! Pro-Chip Spring Golfâ„¢ from SwimWaysÂ® brings the golf green to your very own pool. 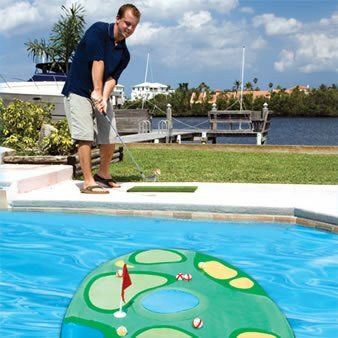 This floating golf game lets you practice your chip shot, flop shot, or putt in your very own backyard. 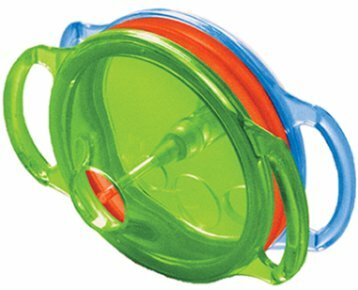 Features a twist-and-fold target green that opens and closes with the flip of your wrist. Includes floating golf target, 12 golf balls, chipping pad, and a movable hole and flag. Carry/storage bag included. 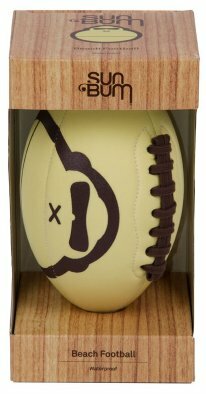 Get out to the beach and make a diving catch for this super soft and safe waterproof football. The Sun Bum Beach Football is made of quality neoprene, sure to last any rough and tough tike or competitive dad. The SwimWays Giant Spring Jam Basketball pool game is big-sized fun for the whole family! 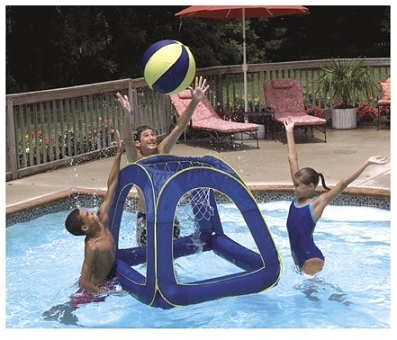 Includes brightly-colored inflatable frame and ball. Easy inflation and patented spring technology make set-up and storage a snap. Stay within quick and easy reach of children in the water at all times. 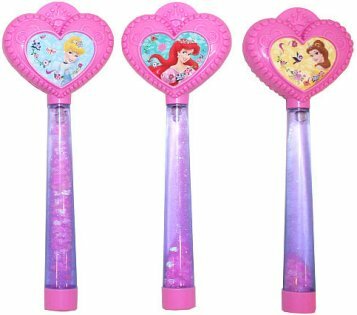 SwimWays Princess Dive Sticks are fun to collect and play with. The soft, flexible design allows for play in or out of the pool! 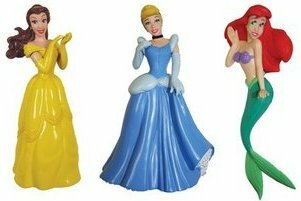 In this package you get Cinderella, Belle, and Ariel. 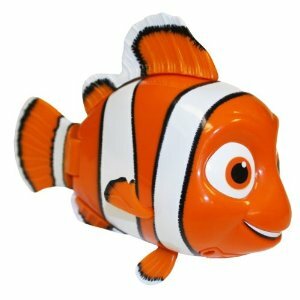 Bring your child's favorite characters from Disney's Finding Nemo to the pool this summer with the Swimming Nemo fish pool toys! Extended battery life for long summer days at the pool. 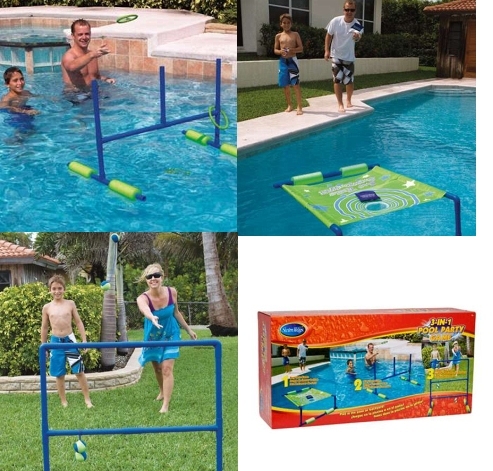 Three of the most popular outdoor games â€“ Ladder Ball, Bag Toss and Ring Toss â€“ in one amazing pool game combo set. The 3-in-1 Pool Party Game Combo easily converts from one game to the next with no tools required. Play in the pool or backyard. Includes all the components for three great games. Ladder Ball includes ladder and three bolas. Bag Toss includes target and three toss bags. Ring Toss includes target and three rings. 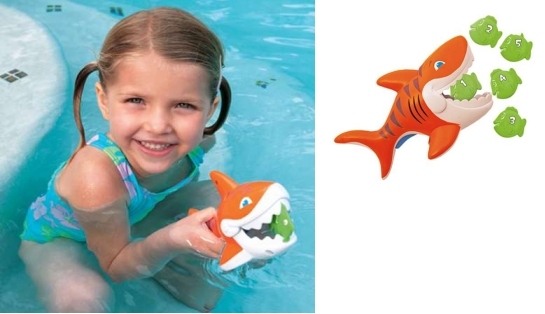 SwimWaysÂ® Battle Reefâ„¢ Microsâ„¢ are kid-powered swimming fish toys guaranteed to get a grin. Pull the string, let go, and watch the fish swim through the water - no batteries required! 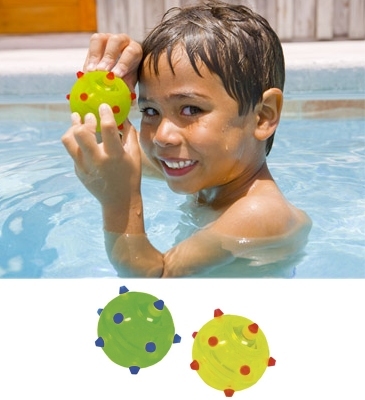 Perfect for little hands, kids can play with these fun toys in the pool or bathtub. 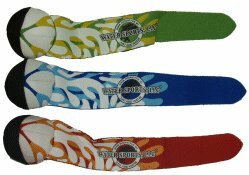 Three brightly colored styles to choose from: Green and Orange Piranha, Purple and Blue Shark, Red and Black Hammerhead. 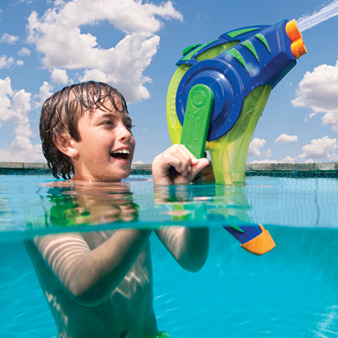 Discover a whole new world of underwater fun with the SwimWaysÂ® Bubble Ring Blasterâ„¢! 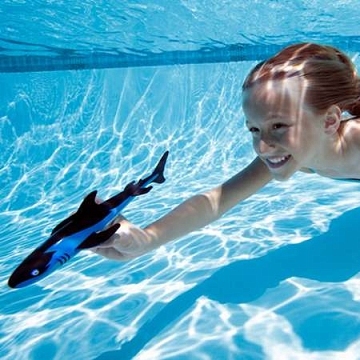 This scientifically advanced pool toy launches powerful bubble rings. Dive under the water, squeeze the handles to release the air inside and watch the bubble rings magically appear. Creates up to 20 bubble rings without having to resurface. 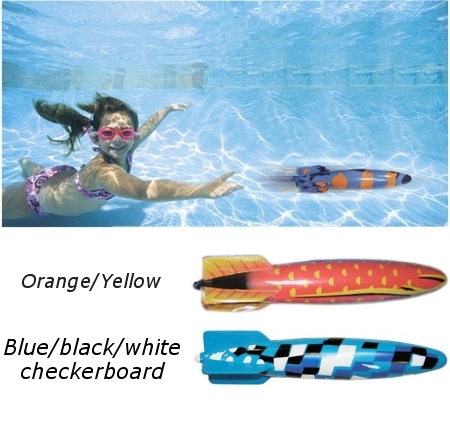 Awesome water shooter and ball launcher - the SwimWays Combo Blasterâ„¢ is two toys in one! This super shooter launches water or plastic ball up to 30 feet. Gives kids more ways to play; more value for parents. 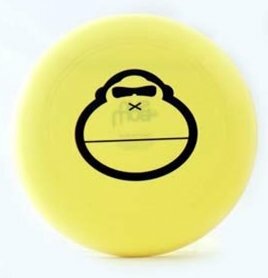 3 balls included in each pack. 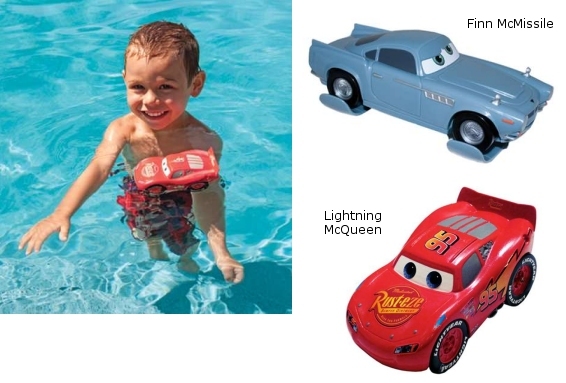 Disney Cars characters Lightning McQueen and Finn McMissile come to life with the SwimWays Sea Racer battery-powered pool toy! Motorized cars move through the water for fun play action. 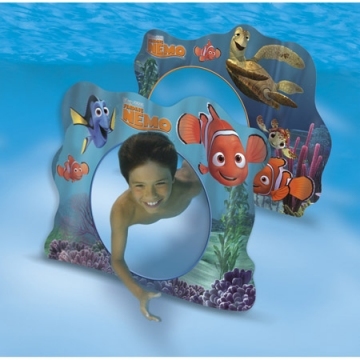 DisneyÂ® Water Wobbliesâ„¢ from SwimWaysÂ® wiggle and jiggle to the delight of little kids! 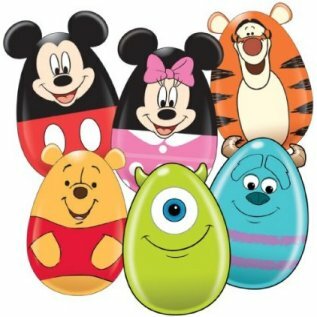 Choose from your favorite Disney characters: Mickey Mouseâ„¢, Minnie Mouseâ„¢, Winnie the Poohâ„¢, Tiggerâ„¢, Mikeâ„¢, or Sullyâ„¢. This is a great pre-school play toy for new swimmers and kids just getting used to the water. One Wobblie per pack. 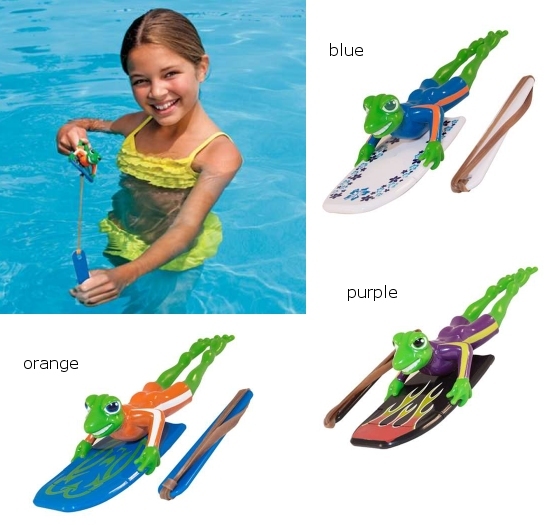 These characters makes Play action in and out of the pool fun for little boys! Measures: Approx. (Lizard)4 3/4" x 2 5/8"(Spider-man) 5" x 4" (spider-man) 5 3/8" x 2"
The SwimWays Dive 'N Glide Shark moves through the water like a real shark. Watch it dive through the deep, then glide to the surface. Kid-powered play for hours of fun. Swims up to 20 feet underwater. Your very own Finding Nemo adventure! Swim with Nemo and Dorey, and ultra cool sea turtles. Springs open in seconds and folds quickly for storage in mesh carry bag. Two hoops in every set. 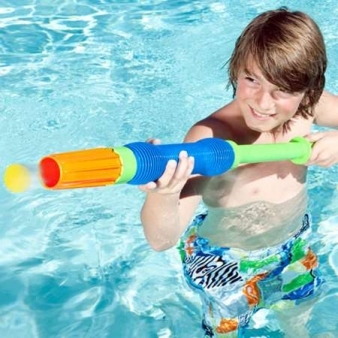 Kids will crank up the adventure with this fierce water shooter! The continuous shooting action of the SwimWays Flood Force Water Cannon makes water wars more exciting. Place the base of the cannon in the water, crank it to draw water from the pool up through the cannon, and unleash an endless stream of water on your target! Cap off the reservoir to launch a pool to backyard attack. Recommended by FoxNews.com, Toy Insider and San Diego Family magazine. This hungry shark has one thing on his mind - and on the menu! Kids squeeze the trigger to open the shark's mouth, then try to gobble up all the guppies as fast as they can. 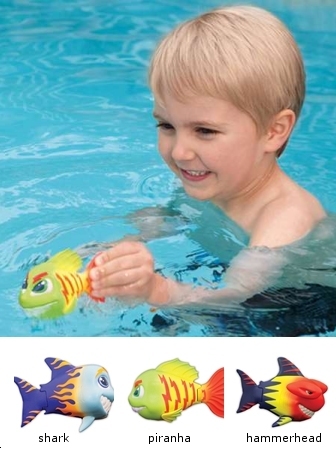 SwimWaysÂ® Gobble Gobble Guppiesâ„¢ includes one shark and five floating guppies in bright colors. 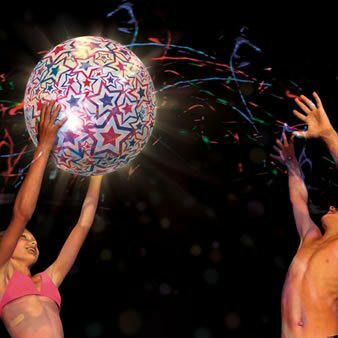 Make the night come alive with the SwimWays Light-Up Beach Ball! 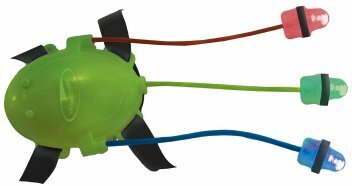 This impact-activated beach ball is perfect for an evening at the pool, in the backyard, or at the beach. Red, white, and blue star design makes the Light-Up Beach Ball a fun pool decoration or toy for Independence Day celebrations! Lights up on impact, flashing red, blue and green. Features super-bright LED lights and includes batteries. Toypedo Original by Swimways provides pool entertainment for kids of all ages! 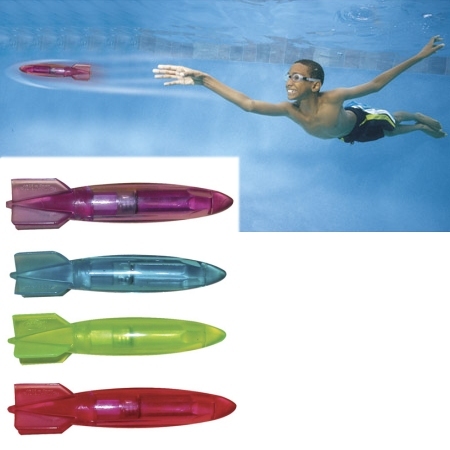 Glides underwater up to 40 feet! The fun of horseshoes meets up with a dunk tank splash in this interactive backyard water game. 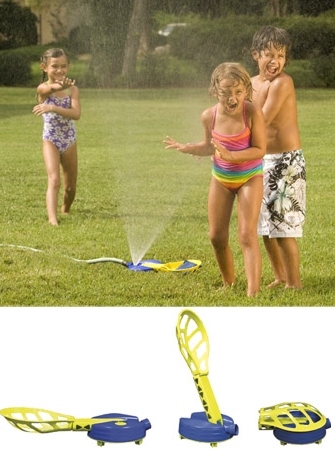 The target connects to the water hose to create a fun-filled game of getting wet. Any number of players takes turns tossing balls at the target. Land a ball in the target and your friends get all wet! Great dive game for the pool or tub! Adjustable to float, sink, or suspend in the water. Players race to catch them! Makes hide-and-seek in the pool a lot more fun! Now you can stay out later and play longer with this Swim Rays light to lead the way. LED lights radiate in multiple light patterns. Attaches to wrist and fingers. Two replaceable button cell batteries included. Ages 6+.